So work has been demanding and leaves little energy for other things, as I mentioned, and furthermore summer is coming, with heat that inspires sloth, and yet one does not live by vicious weeding and iced tea alone. Enter the slow cooker. Most people I know think of a slow cooker as a device for feeding oneself through the winter, but it serves well in the summer too, not least because it doesn't heat up the kitchen very much. What do you make in the slow cooker in the summer, when heavy stews are not on the menu? Pulled pork, for one thing. 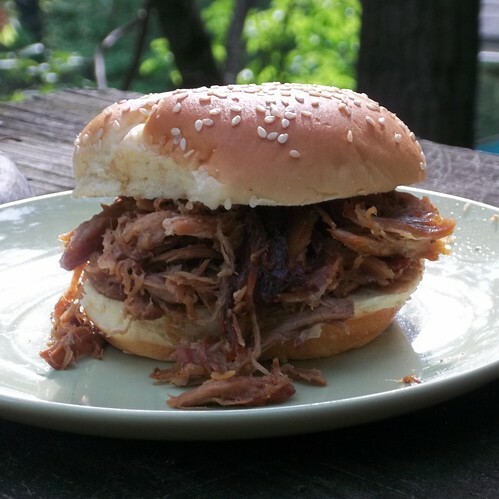 Pulled pork in the slow cooker is easy, summery, makes the Viking happy, and requires very little clean-up. Did I mention it makes the Viking happy? It does. He has given my version high praise indeed, declaring it to be better than the pulled pork from our favourite barbecue place. This recipe is adapted from one I found on Chow. The spice rub was inspired by what I had on hand, and I've made a few other tweaks. If you have a favourite spice rub, feel free to use that instead. I like to do most of the work the day before I plan to serve, and then put the meat and the juices in the refrigerator overnight. This makes removing the fat from the juices easy. If you prefer you can skip the overnight refrigeration and skim the fat off some other way. Slice the onions and garlic thinly and place in the bottom of the slow cooker. Add the beer or stock. If the pork is tied or netted, remove the string. Combine the spices with the honey and salt and rub over and into the pork. Set the pork on the bed of onions in the slow cooker, cover, and set to low. The pork will be ready to pull in about 8 hours. Check it occasionally from about the 6 hour mark to make sure it doesn't just fall apart in the slow cooker. When the pork is done, remove it to a cutting board. Place a colander over a medium bowl and pour the juices from the crock through the colander and into the bowl. Return the onions and garlic to the crock, and refrigerate the bowl of juices. If your pork shoulder included the bone, remove the bone and discard. With two forks, pull the pork into bite-sized chunks, discarding any large fatty or gristly pieces. Return the pulled meat to the slow cooker with the onions and toss to distribute the onions through the pork. Cover the crock and refrigerate overnight. If your slow cooker does not have a removable crock, put the cooked onions and pork into a large bowl to refrigerate instead. The next day, a few hours before serving, return the crock to the slow cooker and set on low. Remove the fat from the juices and discard. Add apple cider vinegar and some of the remaining juices to the pork, a little at a time and just until the pork is moistened. For a 5-lb shoulder, I usually add about 1/2 cup of vinegar and a cup of the juices but go slow and adjust to your liking. Serve on hamburger buns with cole slaw and potato salad, and with barbecue sauce if desired. Saucing pulled pork is a highly personal thing; I usually like to leave it to the eater to decide if, or how much, to sauce. Have you tried refrigerating the pork before shredding? It's an Alton Brown trick. It does some magic to the collagen and makes for even juicier meat. No, I haven't tried that. Maybe next time, though to be honest this version comes out delectably moist, too. I still have about a pint of pork juice in the fridge. I should freeze it or figure out what else to do with it.